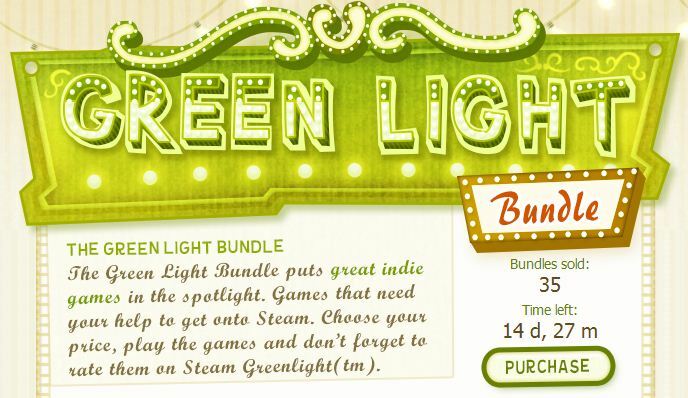 Getting your game on Steam as an indie developer is far from easy, so to spread awareness and increase their chances in Steam’s upcoming Steam Green Light, seven developers banded together to launch an indie game bundle called Green Light Bundle, which contains eight of their games. With this many games in a single bundle, it’s no surprise that it’s been split into two parts: The first four games are available to anyone who pays $1 or more, but to get everything you’re gonna have to cough up at least $5! You’re also gonna need a PayPal account to pick this one up, which is both a good and a bad thing – no need to break out your VISA, but at the same time, there are parts of the world that lack PayPal access. Even though it’s a one-button game in a 2D environment, this puzzler will still make your head spin, as you twist and turn triangles to guide a yellow ball safely through each level. Oh and if you’re still hungry for more after finishing the included levels, I’m sure the 7000+ user-made ones will be able to satisfy your puzzle hunger; also.. why not make your own with the included level editor? It’s very easy and who doesn’t like the idea of having other people enjoy what they’ve created? How about some action-packed platforming with a lot of different fairytale characters? No? How about this twist then: Each creature has a unique set of abilities that’ll aid you through the game’s 15 stages and.. each time you grab a muffin, you transform into one of them! If that doesn’t sound crazy enough to be fun, I don’t know what does..
It’s time to outrun whatever made the entire dinosaur race extinct! Take on the part of a speedy dino as you jump across tar pits while avoiding hazards like crumbling hillsides and meteorite showers; multiplayer included for those who like to show off their dino racing skills against other players. Best described as a “multi-directional side-scroller shoot ’em up”, Syder Arcade is bound to bring back fond memories of games like R-Type, Gradius and Project X. That said, the gameplay is not the only part where the developer has taken a page out of the games of yesteryear, as the level of challenge found within is also a trip back to the 90’s; to a time when games had noticeably less hand-holding and you actually had to be skillful in order to progress, rather than yawn at a checkpoint around every corner. Set in Japan during a time of chaos as war wages across the land, take on the role of Daisuke Shimada on a quest for revenge. Slice and dice your way through several locales (and a bunch of hostile samurai too), including a flying fortress and the legendary Isle of the Dead – nothing is going to stop this samurai from tracking down and slaying his arch-enemy, Orochi. While the “save a damsel in distress” plot has been done to death already, Gunman Clive provides plenty of gunslinging action with challenging levels, a simple control scheme and quite unique boss battles. Not enough information? I’d recommend reading my review then. Wait.. what? A 2D platformer that takes place in a world made mostly of paper and cardboard? At first I thought I was seeing things, but as the developer describes it, get ready to “jump, bounce, port, swim, and fly your way to saving the world!” in Paper Monsters. Last but not least, we have a top-down shooter with crazy weapons, non-stop humor, more explosions than a Michael Bay movie and you play as a guerilla named “Bob”? I don’t see how this one could be anything but an explosive barrel of fun (get it?). The entire thing can be picked up from http://www.thegreenlightbundle.com, provided you have a PayPal account. Don’t forget to pay above $5 if you want all the games and remember that the main reason for this bundle is to spread awareness for the upcoming Steam Green Light, along with selling the games of course, so be sure to tell your friends about it.